Elections in Nepal have never been completely free or fair, and everyone has a favourite example of vote-buying, ballot-stuffing, or booth-capturing. Goons mobilised by political parties often lock up rival candidates or block roads on election day so opposition voters can't make it to the polling centres. There were lots of proxy, underage and multiple voters in the 2008 CA election. These are just the visible irregularities, but what ultimately determines the election result in Nepal are things far more basic: most Nepalis do not know how the voting system works. There is a lot of mass voting where villagers are mobilised by local bigwigs in return for payment in cash or kind from candidates. Like in a lot of other things, we have weak institutional memory and quickly forget the corruption history or criminal record of candidates. Voter opinion is influenced by few weeks of campaigning, misinformation and vicious propaganda. Whoever makes the biggest noise has an edge. Parties know this better than anyone else, and campaign financing has become an integral part of the process, and this is usually ill-gotten or are donations from businesses who extract their pound of flesh once the party is elected. In this way, elections become a key feature in perpetuating the cycle of corruption. Until a candidate or party's victory depends less on the ability to spend money and more on performance, credibility and integrity, elections will never be the determining facet of democracy. Electoral reform, therefore, has to be integrated into the implementation of the new constitution. The erosion of the image of parliamentary parties in the 1990s is in large part explained by the lack of performance and their behaviour during successive elections. The incumbent party used the state machinery, muscle and money at election time. This was one of the reasons the Maoists went to war, arguing that the entrenched elite used elections just to shuffle the deck among themselves. Alas, the party that sought to change all this through armed struggle is now behaving no differently. The Maoists used to believe that political power flowed out the barrel of a gun, now they know it flows out of a cash machine. The Maoists like to portray themselves as the party of the poor, but are now the richest ones around. Leaving aside our austere Mustang-riding prime minister, Maoist leaders drive around in the most expensive cars, live in the most luxurious mansions and have a well-known penchant for the good life. Like the people they tried to physically eliminate until five years ago, the Maoists have understood how money translates to political power. The desperation of Maoist and Madhesi leaders in the current coalition to rake it in is not just because of personal greed, it has a lot to do with ensuring cash flow for the next elections. Every sector of economic life is fair game for "pre-paid" kickbacks, cuts and extortion: casinos, real estate, unions, foreign employment. If this is what the party that espouses the dictatorship of the proletariats looks like, imagine what the others are up to. If political leaders in Nepal have almost zero credibility, it is because their loyalties lie not with the people but with themselves and those who funded their election campaigns. The epidemic of corruption today is a direct result of the conviction among political leaders that future elections can easily be rigged or bought, and there is no need to deliver development to the constituencies. The absence of local elections has 'democratised' corruption right down to the grassroots. The infamous all-party mechanism at VDCs and DDCs have become synonymous with massive and systematic corruption where local units of the parties are in cahoots to loot budgets. In paper, parties are required to disclose their financial details and there is an upper ceiling for the money that parties and candidates can spend during their election campaigns, but few abide by the rules, mostly because there is no one to enforce them. It is clear there is no point having elections, just for the sake of having them. 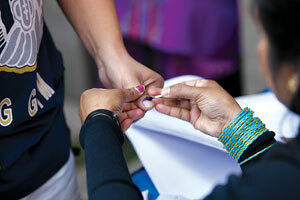 The quality of democracy in Nepal will depend on serious electoral reform. If all goes well, there will be four elections in the country in the next few years: national elections, local elections, provincial elections when the country goes federal, and a presidential or prime ministerial election depending upon the governance system in the new constitution. We cannot afford anymore to elect crooks, undermine our hard-earned freedoms and squander the chance to uplift living standards through unaccountable leadership. A good idea would be to establish a national fund for campaign financing, so the state subsidises parties for elections and levels the playing field somewhat. At the heart of any well-functioning democracy is a free and fair election process which depends on certain criteria: voters are not subjected to threats, intimidation or enticement, they have access to accurate information about the contesting candidates and the voting is based on a system that eliminates chances of rigging or errors to a bare minimum. For proof that this is possible, we only need to look next door at Bihar, where clean elections have yielded clean governments that serve the people. The CA election only had to be peaceful to be successful, but the success of the next elections will be measured on these standards. Since 2010, the Election Commission says it has been working on a "war-footing" on a new voter registration drive. In two years, 10.3 million Nepalis have got voter IDs and the Commission is now sending the list for revision at the VDC level. The new computerised list keeps record of voters' finger prints, photographs and personal information. The digitised voter ID along with electronic voting which the Commission plans to introduce in the next election is expected to reduce duplication and election fraud. 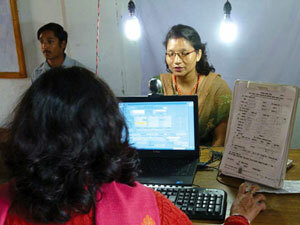 Six electronic voting machines were used in the last by-election and only one was used at the CA election. The Commission expects 4.2 million more registrations and is awaiting the result of the latest census for the data on newly eligible voters above 18. The location of polling booths have been a major source of contention among parties in previous elections, so this time the Commission is using GIS (geographic information system) to maintain a maximum two-way distance of 5 km. An Electoral Education and Information Centre that will work on voter education will be operational in two months. Plans are also underway to digitise election information and make them available to the public. "We are looking at building a system that will allow voters to access all information on the candidates including their educational, financial and political backgrounds," Chief Election Commissioner Neel Kantha Uprety told Nepali Times. "We have done a lot on electoral reforms in the last two years and are confident that the next election would be freer, fairer and more acceptable." Even US suffers from the same problem. I am not sure whether Bihar had "clear elections" as you claim. It would also be fairer and more inclusive if/when millions of people working abroad can participate. well-written article; i think nowhere has a quick and clean system as you wish to see. Journalism could help to establish the freer, fairer and acceptable system, but the journalists are already imprinted with the reeking stamp. Indian democracy depneds on voter frauds. You can make the same case about UK and USA. Highly educated, mostly lawyers are elected to the US Congress and they bicker and fight amongst each other and yes, you guessed, the people are losers. So, Ph D Baburam, a convert from a communist to a money hungry capitalist, what will one man accomplish. But, screw politics. We need jobs, foods, shelter and education, if these are readily available, all politics can go to hell. #4 I enjoyed reading your comment: "Indian democracy depneds on voter frauds. You can make the same case about UK and USA"
Can you give me a specific example of voter fraud in the UK to justify your comment? reply to Y Care - voter fraud is compared to the corruption in the government. U know, the scandal with the Murdoch and others. Buying political infulence with money as well as intimidation and abuse of public funds by the MPs. Its an immoral act, you can call it what you want. Nepalis need to get ready for another rigged election. The CA will cease to exist after 27 May. The Party with the most money and goondas will win a bigger slice of the pie. The common people will continue to suffer. This is how things are done in under devloped and uneducated society. In advance countiries, the people give a crap about politics. Politicians have no prestige and the common people despise their governments. At a recent by-election in Glenrothes, Fife, Scotland at which the SNP (Scottish National Party campaigning for an independent Scotland) were expected to win the British Labour Party won. Postal votes, which were usually about 2000 in that constituency, came in at nearly 9000 and then all voting records, voting papers and marked up voting registers which by law have to be available for public scrutiny for one year were all "lost" before anybody was able to examine them. There have been several prosecutions for electoral malpractice, mainly by the Labour Party, in UK in recent years. You should keep an eye on Scotland. Without Scottish oil revenues UK is bankrupt and we have no doubt that dirty tricks and worse are coming to Scottish elections. Thank you David Hill ! No. 5 Y Care. Did you get the answer you were searching for. Whether its Nepal or India, or USA or UK, politicinas are the most crooked members of society. We should pity them for they tell lies each day to make a living. They steal each day from the taxpayers. They have no shame. They parade themselves naked in public. Zero integrity. Beg to ask the question, Y care, are you a politician, you must be for birds of same feathers, you know. Its time for Nepali Army to take the helm. Please do not waste millions and millions of ruppes in an election that will be rigged. Let the Army restore rule of law. Those tried and found guilty of treason and corruption can rot in jail. Every one in Kathmandu knows who these people are. The corrupted Police force needs an overhaul. Dahal or Bhattarai, Madhav or Jhala Nath,all have failed in their sworn duty to defend and protect Nepal. They have only gotten rich beyond their wildest dreams, that by looting and corruption. The Army can run the show for the next 10 years. Then we can have a free and fair poll. Why keep going down the path of failure when we can all be winners. Truth is elections under the King in 2005-06 would have been far fairer and probably would have yielded the right leaders than any other election that our country has seen. That's precisely the reason why all the crooks who lead the so-called 'democratic' parties ran off to Delhi to cahoot with the Maoists. They knew they'd stand no chance of being (re)elected in a fair race! Why must I be a politician? Because I asked a question? Thank you for the Scotland example. I wasn't aware of it and was interested to know of it. Disgraceful.